“Full Tilt has identified and corrected the cause of an inadvertent message in its play money iOS app which incorrectly stated that Full Tilt was licensed and would soon be launching in New Jersey. We have been developing a real-money mobile poker app that has been submitted to the NJ Division of Gaming Enforcement [NJDGE] as part of the review process of our application to offer real money gaming under a NJ DGE license. 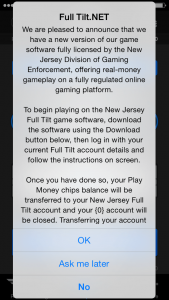 Unfortunately, a bug in an update to the Full Tilt play-money poker app inadvertently included a pop-up window alerting players in New Jersey that a licensed real money offering is available. As a result of the bug, a very small number of people were exposed to this pop-up before we resolved the issue. This was only a message alert; at no time was a real-money app available. No one had the ability to play real-money games, nor register for the ability to play real money games on Full Tilt. The bug was identified and fixed within hours of being alerted to the issue. But let’s backtrack and catch you up on all the craziness that led up to this announcement. It seems a Full Tilt online poker player living in New Jersey was rather surprised this week when a splash page appeared on his iOS version, announcing the company was now licensed to offer real-money gameplay. Dennis Lopez, who describes himself on Twitter as a poker player and freelance writer, tweeted the message to Full Tilt, which immediately confirmed it was an error. The screen grab obtained from Lopez’s Twitter feed shows Full Tilt claiming to be fully licensed in the Garden State. While the premature announcement might have gotten New Jersey poker players’ hopes up, it does signify that Amaya Gaming Group, owners of both PokerStars and Full Tilt, believes it is close to bringing the cardrooms to the state’s nearly nine million residents. Ever since New Jersey Governor Chris Christie signed a bill permitting Internet gambling into law in February of 2013, poker fans have been anticipating the arrival of the two largest poker sites in the world. But credit card processing problems, dwindling player pools, and a constantly changing legal landscape have hampered the game’s growth in the Garden State. 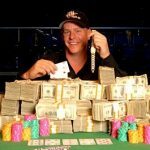 Of course, welcoming PokerStars and Full Tilt would greatly increase participation and provide a much-needed economic bump. State Senator Ray Lesniak has been leading the charge in bringing both sites to New Jersey. Following a lengthy delay, Lesniak put pressure on Christie to expedite the process regarding the Division of Gaming Enforcement’s (DGE) licensing approval. Although Lesniak predicted in August that PokerStars and Full Tilt would arrive before the end of the year, the senator now says he expects them both to be up and running sometime in March of 2015. Amaya recently announced drastic changes to its corporate strategy for 2015. Headquartered in Montreal, the company revealed plans to buy back $140 million of its publicly traded shares over the next 12 months. It also publicized a desire to continue folding on business-to-business properties. One B2B asset worth noting is Amaya’s selling of the Ongame Network, an online poker provider that served current NJ operators bwin and Betfair. The approach indicates Amaya wants to place more emphasis and focus on its two largest entities moving forward. Neither the DGE nor Amaya have publicly commented on the drawn-out approval process of its online gambling application. Many theories exist, from Christie’s close ties to Sheldon Adelson, to PokerStars simply not being quite ready post-acquisition, but the fact remains that bringing the cardrooms to the state seems almost inevitable. The fact that Full Tilt has already drafted its real-money gameplay announcement is certainly a good sign. So although the road has been long and bumpy, it appears PokerStars and Full Tilt are closer than ever to opening up for business in New Jersey.